With another resounding day of $37-0 support, Renamon continues to widen his height lead by nearly 400m now! 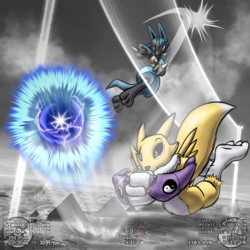 All that extra height easily helped him clear the airplane contrails set out across Toronto, and reduces Lucario's game lead to 6-5! Will she be able to catch up to such a monstrous lead? 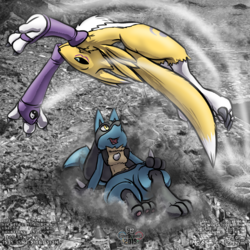 Will Renamon continue to take victory out of the Pokemon's Paws?